In the 1920s, Roy Gaudette was just a young man - with polio. But Roy was determined not to let disability prevent him from living a worthwhole life. He opened the Gaudette Insurance Agency near Grafon Common in 1926 and began writing auto insurance policies for friends and neighbors alike. Roy’s initial success convinced younger brother Gerry that there might be a future in insurance. At the age of 16, Gerry Gaudette, Sr. set up his own agency in the Rochdale section of Northbridge and both businesses flourished. When Roy passed away in the later 1930s, the two agencies were merged. In 1926, Gerald Gaudette, Jr., armed with a college degree in insurance from the University of Pennsylvania, joined his dad and dedicated himself to expanding the business throughout the Blackstone Valley. Over the years, Gerry oversaw more than a dozen acquisitions of other agencies and a steady growth of business. 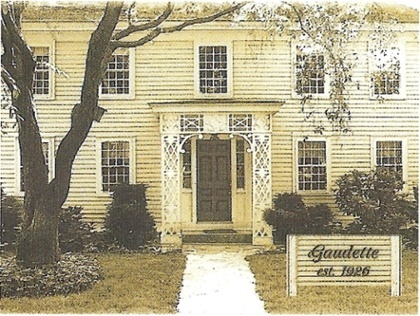 By the 1980s, Gaudette Insurance had become the largest insurance firm in the Blackstone Valley. Gerry Gaudette passed away in September of 2003, leaving a legacy of community service, sound financial management, and the ability to see the larger Blackstone Valley picture. “He was the first to look at the Blackstone Valley as a distinct entity,” recalls Gerry’s son Lee. “He was trying to brand and position the Blackstone Valley as a region long before the ideas came into vogue.” And Lee’s goal is to carry on his father’s vision. With a degree from Tufts and an MBA from Babson, Lee Gaudette joined the firm in 1990. Starting as a commercial account executive, Lee worked his way through the ranks, moving to sales manager in 1996, vice-president of sales in 1997, and ultimately president of the agency in 1999, becoming the third generation of Gaudettes to guide the agency. In the sixteen years that Lee has been at the helm, two additional agencies have been acquired and revenues have nearly doubled. Lee attributes much of his success to his father’s business model, education, and to Frank Bartucca, who served as president of the company from 1995 to 1999. “Frank played a key role in my development, helping me make the transition from sales to financial management, client and carrier relations, and finally executive functions.” Bartucca joined the firm in 1979, and was recently recognized for 25 years of consecutive service. Among Blackstone Valley businesses that began in the 20th century, Gaudette Insurance stands at the top, both in terms of financial success and the legacy of service the organization provides to the Blackstone Valley community. Gaudette Insurance Agency has been recognized both by the Independent Insurance Agents of America as a “Best Practices” agency - one of the top 30 agencies nationwide for customer service, growth, stability and financial management, and by the Massachusetts Association of Insurance Agents with the prestigious Five Star Award of Distinction. Great-Uncle Roy would be proud.